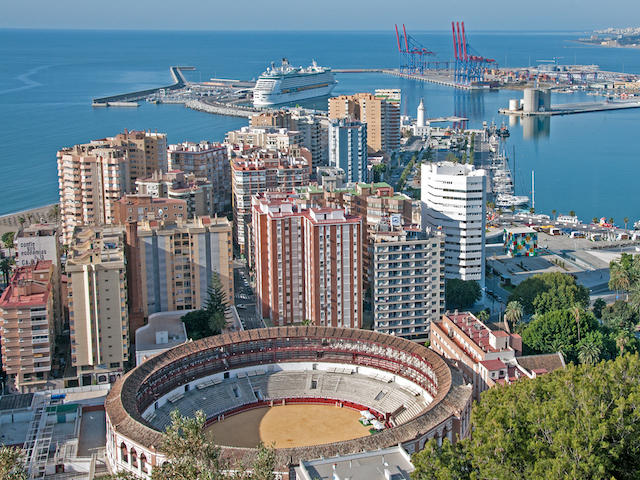 The Port of Málaga appears on the itinerary of many cruise line companies bringing almost 750,000 passengers to the Costa del Sol’s main city every year. Such is the volume of maritime visitors that the whole port has had to be redeveloped so as to provide state of the art facilities for cruise ship passengers. The exact docking location of your ship will depend on the size of your vessel and the volume of traffic at the time of your arrival. Muelle de Levante: The Eastern Wharf is the main arrival point for the largest cruise which lies approximately 2.5km from the entrance to the city. 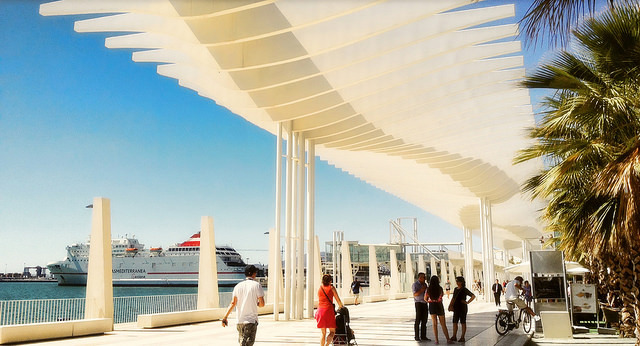 Your cruise line or the port authorities will usually provide a shuttle bus service from here to Plaza de la Marina which lies between the Alameda Principal and Paseo del Parque in the city centre. If you don’t wish to board one of these shuttles you’ll be able to get a taxi to take you into the city. The impressive Maritime Station at the Eastern Dock has two terminals (A and B) and has have been built with the intention of being able to deal with a million passengers per year. Palmeral De Las Sorpresas: If you arrive on a smaller cruise ship you may be able to dock at Wharf 1 (Ricardo Gross) or Wharf 2 (Guadiaro) which are much closer to the city centre so no transport is necessary from your ship. ‘Muelle Uno’ (Quay 1) is home to a full-scale leisure and entertainment complex with a vast array of shopping opportunities. ‘Muelle Dos’ (Quay 2) is a beautiful waterfront promenade right in the heart of the city which is lined with palm trees. It has a small cruise terminal. Take a look at the map on the Port of Málaga website to get a better idea of where these docks are located. Walking: Nearly all of Málaga’s main sights lie within a compact area in the historic centre making them very easily accessible on foot. One exception is the Castillo de Gibralfaro which stands atop a hill overlooking the port and is too steep a climb for many visitors. It’s a good idea to get a city map from the main Tourist Information Office (Plaza de la Marina, 11) near the port. They also have a very useful leaflet called Eight Hours in Málaga which list all the main tourist attractions and suggest a self-guided walking tour. Tourist Bus: Deciding whether the ‘hop-on, hop-off’ bus service is worthwhile in ports around the world has become a major pastime for cruise ship passengers. In the case of Málaga I’d suggest that it isn’t necessary provided that you have a modicum of fitness as most of what you’ll want to see is within such a small area in the Old Town. If you do decide that you’d like to take the Málaga tourist bus you can join it in Plaza de la Marina. The Red Route with 15 stops covers most city sights whilst the Green Route goes further afield to include the Botanical Gardens and the Automobile Museum. 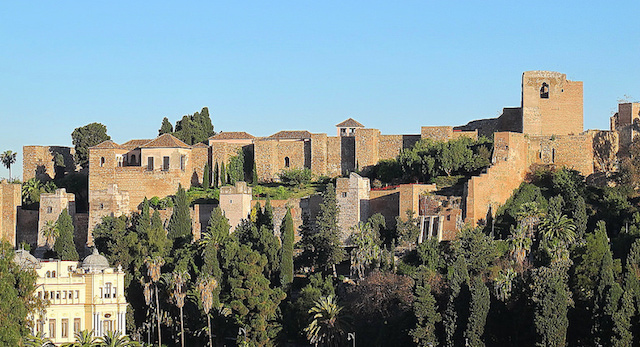 At the Alcazaba there’s an option to join a guided city walking tour. Other: For novelty value you can take a horse drawn carriage from Plaza de la Marina which tours the streets of the historic centre. Taxis are always available for getting around and prove to be a handy way to get up to the Gibralfaro Castle should you so wish. Most cruise ships visiting Málaga arrive in the early morning and depart in the late afternoon usually leaving passengers with approximately 10 hours in port. For the majority the decision to make is a simple one: stay in Málaga for the day or take a shore excursion to the Alhambra Palace in Granada. Other options do exist but these are the most popular choices. Alcazaba: (Calle Alcazabilla, 2) Dating back to the 11th century this palace-fortress once served as home to the city’s Moorish rulers. Although it hasn’t been restored and protected in the way the Alhambra Palace in Granada has been, it remains a remarkable example of Moorish architecture. Roman Theatre: It’s fascinating to see this Roman Theatre from the 1st century BC located right next to the entrance to the Moorish Alcazaba. Restoration work remains a work in progress. Castillo de Gibralfaro: This castle stands on a hill a little to the north-east overlooking the city. You can walk there from the entrance to the Alcazaba in about 25 minutes via Paseo Don Juan Temboury but it’s a fairly steep climb. You’d probably be better off taking a taxi or hiring a Segway to get there otherwise miss it out altogether and head west towards the cathedral area. Málaga Cathedral: (Calle Molina Lario, 9) Construction of the city’s main Christian building began on the site of a former mosque in 1528 and took more than 250 years to build. Its south tower was never completed earning it the nickname of ‘La Manquita’ (The One-Armed Lady) amongst local Malagueños. Plaza de la Merced: This lively square within the historic centre is lined with bars and restaurants. The most famous building within the square is the Museo Casa Natal (Plaza de la Merced, 15) which was the birthplace of the artist Pablo Picasso. Museo Picasso: (Calle San Agustín, 8) Just 200 metres away in the Palacio de Buenavista is the city’s Picasso Museum which houses 285 of the artist’s lesser-known works. The locating of such a museum in the city of his birth has certainly played its part in attracting tourists to a city that used to be thought of as little more than a gateway to the Costa del Sol. Mercado Central de Atarazanas (Calle Atarazanas, 10): Once you’ve had your fill of history and culture, or when you decide it’s lunchtime, head for this newly renovated market which once served as a Moorish shipyard. The place is packed with local people doing their daily shopping at the many fresh food stalls. Visitors can pass some time strolling around this bustling venue before enjoying lunch at one of the market’s tapas bars. Highly recommended is Bar Mercado Atarazanas for great seafood dishes. If you can’t get a seat just head across the road to El Bar de los Pueblos (Calle Atarazanas 15) for a ‘Menú del Día’ or tapas at this popular local joint. Antigua Casa de Guardia (Alameda Principal, 18): Just a couple of minutes’ walk from the market on the Alameda Principal is Málaga’s oldest tavern where little seems to have changed since it opened its doors in 1840. Visitors can stand at the bar and order a selection of local wines from the wooden barrels and see their bill chalked on the bar by the waiters. Plaza de Toros de La Malagueta The classic view of the Port of Málaga is taken from the Gibralfaro with the city’s bullfighting arena in the foreground. It has a capacity for more than 9,000 spectators and has been hosting events since 1876. Nowadays the main bullfights are held here in August during the Feria de Málaga. Search All Shore Excursions from the Port of Málaga. Known as ‘Al-Andalus’, modern-day Andalucia was under Moorish rule to varying extents geographically between 711 and 1492. 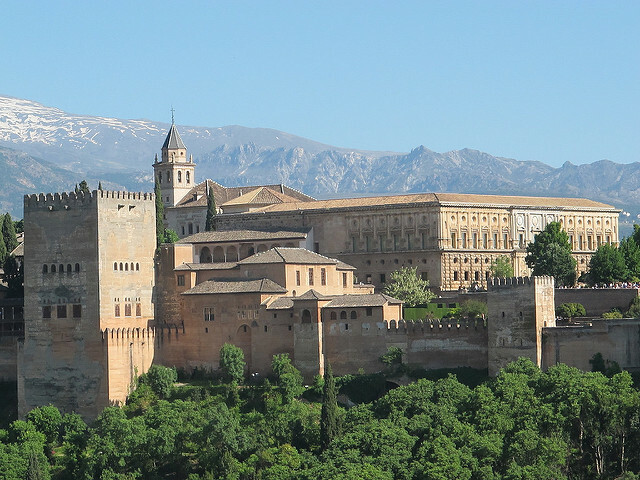 The Alhambra Palace started life as a minor fortress before being converted into a magnificent palace-fortress by the last rulers of Moorish Spain, the Nasrid Dynasty, during the 13th and 14th centuries. Most cruise ships arriving in the port of Málaga offer shore excursions to this UNESCO World Heritage Site which lies 150km to the north-east of the port. The journey takes approximately 1 hour 45 minutes by road no matter whether you take the inland route via Loja or the coastal route via Motril. On official shore excursions offered by the cruise company’s there’s rarely enough time to see anything of the city of Granada. However, if you book a private, small-group tour to the Alhambra and you have some time to spare it’s well worth heading down from the Alhambra to Plaza Nueva along Cuesta de Gomerez then along the Carrera del Darro into the Albaicín district. This is the largest and most characteristic Moorish quarter that survives in Spain. Here you can visit the Mirador de San Nicolás which offers a spectacular, panoramic view of the Alhambra with the snow capped peaks of the Sierra Nevada mountains in the background. Ronda: Lying almost 2 hours away from Málaga Port this historic town lies in the mountains inland from Marbella. It is a beautiful destination but involves a lot of time on the road when time in port is fairly limited. On the return journey private tours might drop in briefly to the quaint white village of Mijas Pueblo. Mijas Pueblo: A more time-friendly option would be to combine a city tour of Málaga with a visit to this whitewashed village with its cobbled streets. The drive to the south-west only takes about 45 minutes so can be included in you day’s itinerary. Cuevas de Nerja: The other main excursion enjoyed by cruise ship passengers is to this vast cave structure which is located approximately 60km east of Málaga near the popular holiday resort of Nerja. The caves are a popular attraction which have been well prepared to allow visitors to safely descend into a tourist-friendly section of caverns. 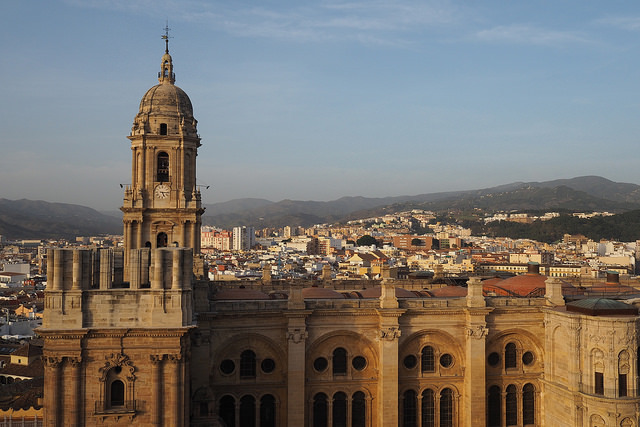 This visit can also be combined with spending some time in the city of Málaga.